Classical Music Venues Can Compete, With the Right P.A. If you thought pop music was a tough neighborhood, you oughta see what it’s like over on the “better” side of the tracks. Municipal symphonies and their concert halls have been under tremendous pressure in recent years as the endowments that most of them have relied on for the better part of a century have been drying up. The Great Recession accounts for much of that, and donation funding that once might have come their way is being increasingly channeled to political activities. Recent changes to federal tax laws that limit the benefits of charitable contributions won’t help going forward. Symphonic orchestras have been undergoing a painful metamorphosis that’s seen several of the leading ones, such as the Minnesota Orchestra, the Indianapolis Symphony Orchestra and the Atlanta Symphony Orchestra, lock out their own musicians over pay and pension issues. Their concert hall homes haven’t fared much better. Construction of new ones continues, yet at a much slower pace, and mostly in affluent communities that can afford to build them (though not necessarily support them) or as a result of corporate branding, both of which characterize the Disney symphony halls in Los Angeles and Orlando. All this has left concert halls and their symphonies looking at less conventional ways to raise revenues. The most commonly employed approach is to create a schedule of hybrid shows, in which pop artists, and often their backing bands, perform with the orchestras in the concert halls. For instance, this coming season for the Nashville Symphony will see Mahler and Brahms balanced by shows the orchestra does with the Mavericks, Martina McBride and Styx, while Hanson played with the National Symphony Orchestra this summer. 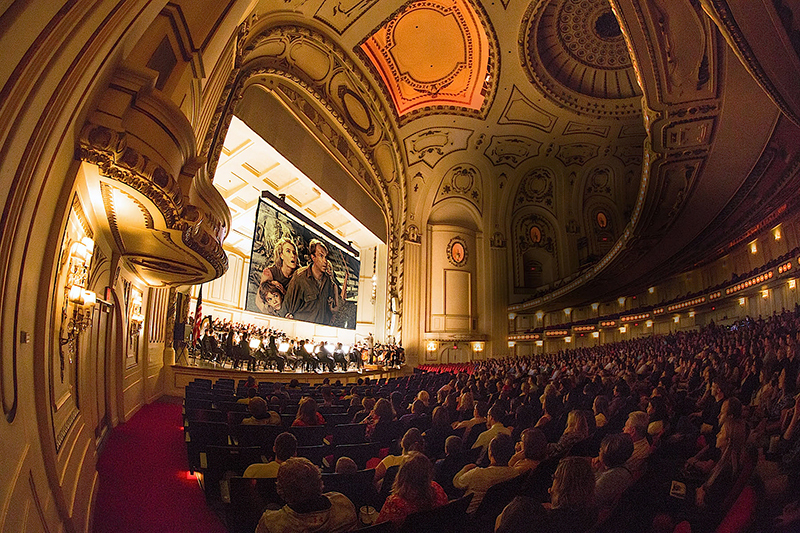 Others have been partnering with other aspects of pop music and pop culture, such as the Milwaukee Symphony’s performances earlier this year of Michael Jackson’s songbook, or when the Pittsburgh Symphony Orchestra played the score to the film Harry Potter and the Sorcerer’s Stone live to picture in its Heinz Hall home. That’s one of the tactics being deployed by the St. Louis Symphony at Powell Hall. Its home is — appropriately enough — in what was once a 1920s cinema palace, from an era when movie theaters were built to be palatial, people dressed up to go to the movies and orchestras supplied live scoring. The SLSO will be backing Star Wars this season, and the audience for the most part will be wearing jeans and sweatshirts. But if it gets them into the venue, Maggie Bailey, the venue’s managing director, is fine with their sartorial choices. But these hybrid musical applications, as well as the need to let the halls out for a range of rental uses, from corporate events to TED Talks to real estate moguls’ get-rich-quick presentations, means that the classical concert hall has had to increasingly do something that those venues weren’t intended to: become amplified. It’s a phenomenon that’s been going on for some time, but at a fairly low level — house systems in this category of venue are largely not of the sort seen on most contract riders, and touring music artists that require that level of audio requirement will usually bring their own sound in. Unfortunately, while a rental system is often better than what an older classical venue might have for its installed sound, a visiting system will often require substantial tuning in what are often (and purposely) acoustically eccentric spaces. In smaller halls, the combination of limited ticket-sales revenue and the cost of both renting and tuning the system for a single night’s shows might be economically impractical. But in show biz, timing is everything. The P.A. business has seen a huge uptick in demand for quality sound systems for everything from tours to football games. That expanded demand, driven by music touring as recorded music fades, has attracted new brands to the market, increasing competition. At the same time, sound-system brands and the SR providers who sell and rent them have moved deeper into the installed sound sector, with touring-level systems being installed instead of loaded onto trucks every night after the show. The change in the industry’s dynamics is compelling brands to look into new markets to keep up. That’s why in 1,700-seat Powell Hall that day, we were listening to music through a P.A. system that we’re used to seeing in 100,000-seat college football stadiums. On either side of the stage, a combination of Danley Sound Lab’s JH-90 Jericho Horn topped with a Danley XD-62 aimed at the venue’s balcony. The Jericho is the same box that’s in the scoreboard at the University of Michigan’s football stadium which, at more than 107,700 seats, is the largest in the country. If the idea of a speaker that can overcome the roar of an October college-football game is equally well-suited to a classical music gallery produces any cognitive dissonance, there was none in evidence that afternoon at Powell Hall, where a group of orchestra and board members and others seemed rapt, listening to Sinatra and Shubert over speakers that could also let 100,000 screaming fans know that Wolverines coach Jim Harbaugh had better prepare for another dousing of Gatorade. There’s no shortage of avenues that P.A. makers can explore; the challenging part will be determining which ones are the best fit. There was some serendipity in the matchup between Powell Hall and Danley — it’s not one that’s immediately intuitive. But it clicked. As the old aphorism in the music business goes, you get a lifetime to write your first record and a year to write your second. Continued success in an innovative pairing like this will take plenty of marketing elbow grease to properly leverage going forward. On the other hand, you never know until you try. That’s what a lot of brands in the live-sound sector are going to be doing a lot of in coming years.